Happy Monday! And to start off my week I made two cards for today's CAS (clean & simple) challenge. Today's challenge was to layer two different shapes on our cards. The shapes I used on my Easter card are circles and squares. My card has more layers on it than I usually use, but I think it's still clean and simple, my card was really quick to make and hardly any coloring. The pink square on my background is actually four smaller pink squares. 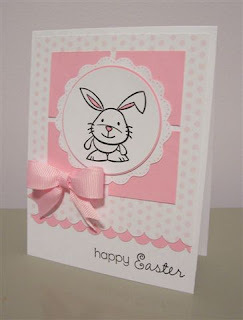 My bunny image is layered onto a pink circle and a white scalloped circle. 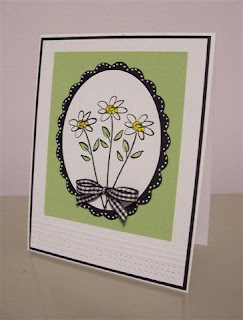 I used my scallop border punch along the bottom of my patterned and pink card stock. The bunny image is from a $1 stamp that I picked up at Michael’s yesterday. I thought he was so cute and I just had to buy him. This is the first time I've ever purchased and of the $1 stamps and the first time I'm using one. I'll have to be sure and check the dollar bin next time I go shopping! And this is the second card that I made this card for today's CAS challenge. The shapes I used on this card are ovals and a rectangle. I just stamped my flower image using my stamp-a-ma-jig and then I colored it a bit using my SU Markers. I added some white dots along the edges of my black scalloped layer. It might be hard to see in my picture, but along the bottom of my card I added a few rows of paper piercing and a few score lines. Although I didn't add a sentiment on this card, I thougth it would be a really nice Mother's Day card. Patty, BOTH are great! So pretty and cute.